Another comfort food that is better next day. This version is no-fuss, slow cooker job. 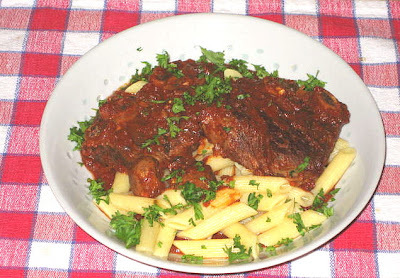 I cooked tomato sauce in slow cooker for 8 hours one day, stored most of the sauce for future use and then cooked the browned ribs in 2 cups of sauce left over and served next day. The flavor was incredible. I can just imagine how this sauce with shredded short ribs meat would shine in a Lasagna. That is exactly what I will do with my leftovers. This recipe looks more complicated in writing then it is in reality. Turn the heat on a crock pot to Low - 6 hours. Sprinkle the ribs generously with salt and pepper on all sides. Heat a heavy bottomed skillet, add olive oil and when oil starts to smoke drop in ribs and brown on all sides. When all pieces are golden brown move them to preheated crock pot. Pour off all oil leaving just a thin film. Stir in garlic, onions, carrot and paprika and sauté till soft. Off the heat pour in Marsala and deglaze the skillet. Put back on a heat and reduce till only 1 Tbs. of Marsala remains. Add tomato sauce, tomato paste, sugar and rosemary and bring to boil. 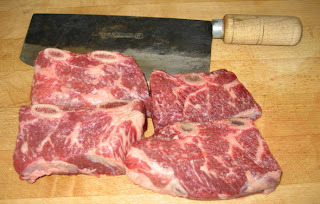 When boiling, turn off the heat and empty the skillet over the ribs in crock pot. The liquid should almost cover the ribs. Meanwhile cook penne till al dente. Close to end of cooking add balsamic vinegar and lemon juice and taste for seasoning. For smoother texture and richer sauce remove ribs to serving platter or individual plates and using immersion blender liquefy the sauce. Serve the ribs on deep platter with sauce and penne and garnish with chopped parsley.